Moose Clothing Company has signed on as “Official Co-Sponsor” for the 2018 Tour of Sri Lanka by the South African National Cricket Team. 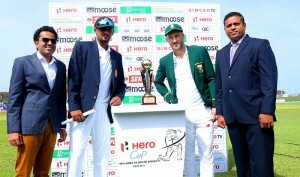 Kicking off on July 12, 2018, and continuing until August 14, 2018, this highly anticipated cricket series sets South Africa’s Proteas against Sri Lanka’s Lions in the Lion’s own backyard, giving them home field advantage. The audience of millions watching this series at home and abroad will no doubt help Moose Clothing Company’s aspirations of becoming the No. 1 Life Style Clothing Brand in Sri Lanka. Having entered the Sri Lankan retail market in 2016, Moose Clothing Company has already established itself as the leading brand for cotton pants for Men and Women. The company currently works with Nolimit, Diliganz, Cool Planet, Cotton Collection, Kandy, Fashion Bug and Thilakma as well as all other major fashion retailers in Sri Lanka. In fact, Moose Clothing Company products are available at over 100 stores island-wide. Importantly, Moose Clothing Company has a very strong online presence and is the only company in Sri Lanka to offer free country-wide delivery. Moose Clothing Company products are also being sold in Africa, the Middle East and plans to launch in Indian, Europe and the United States in the near future. Further, the company has a larger goal of becoming an International brand name and representing Sri Lanka on the global stage. Having achieved rapid success, the Moose Clothing Company has become known for differentiating itself due to its ability to offer high quality products at very affordable prices. By investing heavily in R&D, the company has always endeavored to strive for that Perfect Fit, taking Moose Clothing Company to new levels of quality and style.